With striking yellow,orange or red flowers, and abundant sword shaped leaves, crocosmias create a splash of vibrant colour from late summer to early autumn. 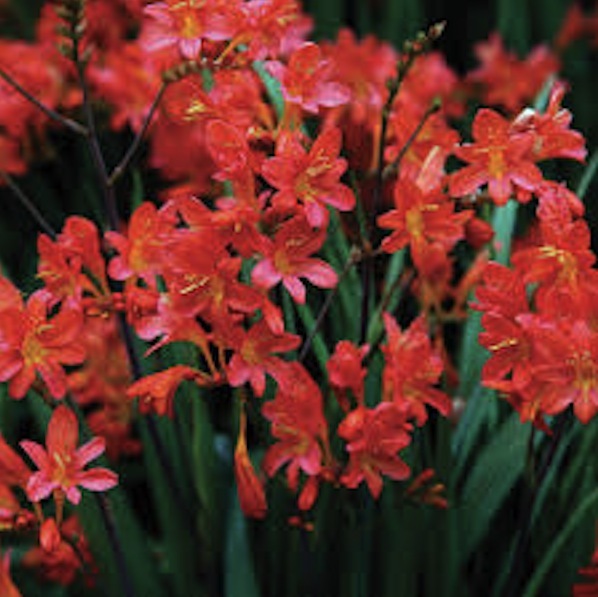 Crocosmias prefer a well drained moist soil in sun or light shade. Some varieties can be invasive and clumps should be split every three years to maintain vigour and flowers.Severn Sunrise has warm peachy-pink flowers on dark bare stems which open wide to great effect. Categories: A-D, Autumn, Featured Plants, Plants A-Z, Plants by Season, Plants In Situ, Summer, The Hot Border, The Smoking Border, The Vegetable Garden. With striking yellow,orange or red flowers, and abundant sword shaped leaves, crocosmias create a splash of vibrant colour from late summer to early autumn. 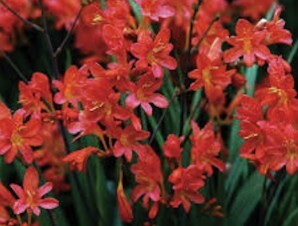 Crocosmias prefer a well drained moist soil in sun or light shade. Some varieties can be invasive and clumps should be split every three years to maintain vigour and flowers.Severn Sunrise has warm peachy-pink flowers on dark bare stems which open wide to great effect. Flowers Aug-Sept.